Time to Focus and Win! What a great way to start off 2012 -- a pledge for safe driving, and a 2012 Ford Focus! There's still time to make your pledge and enter to win! Entries are accepted until December 14, 2011. 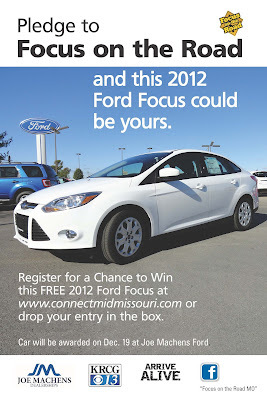 Follow Focus on the Road at www.facebook.com/focusontheroadmo or visit www.connectmidmissouri.com/focusontheroad.